In 1855 Rudolph Virchow postulated that every cell in the organism comes from another cell through the process of cell division ("Omnis cellula e cellula"). There is a multitude of observations showing highly ordered patterns of cell divisions in tissues. However, the question: How do the cells divide in the organism? remains to be answered. We know that the laws of Nature appear to us when we find some restrictions, limitations inherent in the very nature of physical bodies and of the processes that we are studying. In other words, we can say that laws of Nature actually represent the predictable outcomes that must occur under these intrinsic limitations. Do such limitations exist for dividing cells? If so, is it possible to theoretically construct a tissue with these limitations applied and to make a computer simulation of cell division? The following limitations, indeed, exist: 1) the cell divides into two cells, 2) the cells in a tissue are connected with each other and can not move freely within the tissue. If we accept that the tissue is not just a sac with cells that can move around, but an integral structure, we can regard the tissue as a crystal with the cells as the elements of a crystal. There is, however, a great difference here. In crystals, new elements are added from the surrounding solution into the specific sites on the surface of the lattice, but the new elements in the tissue, the cells, are added by the division of the existing cells inside the tissue. When cells divide in the embryo, it grows and becomes a different structure. But, in the adult tissues, their size and structure are kept unchanged despite of the fact that some of them renew their cells, i.e. replace the old dying cells with new ones, sometimes at a considerable rate. How do these tissues avoid suffering a great number of "defects" as a result of repeated cell division? It has been shown previously on a model of the intestinal crypt (Ref. 1) that maintaining permanent structure and size is possible when the division, although going on inside the tissue, proceeds from cell to cell by a wave following certain directions in the "lattice" of a tissue-crystal and obeying some topological rules. Most importantly, no breakdown of the cell contacts ever needs to occur. This model, built from purely topological considerations, resulted in periods between successive cell generations coinciding with the periods found in the previous model deduced from the principle of the limited number of cell generations in the organism (Ref. 2). Photo 1. Intestinal epithelium separated from the underlying tissue. The villi are seen as "caps". Photo 2. View from the crypts' side. "Caps" are seen from the inside. Photo 3. A row of the villi connected by crypts is stretched by two needles. The animal intestine is lined inside with a one-cell thick layer of tissue - the epithelial layer. This lining covers a curved surface with hill-shaped villi, and it also goes, uninterrupted, into the finger-shaped depressions, forming there the crypts of Lieberkuhn situated around the villi. In the crypts, we find the fastest dividing cells in the organism. The cells multiply only in crypts and they move on to the villi and are eventually shed from the tips of the villi into the intestine. The entire cell layer (which can be regarded as a two-dimensional lattice) has no gaps; the cells are tightly packed and even connected with each other by cell-cell junctions. The photographs (made at different magnifications) show the epithelial layer separated from the underlying tissue. One villus is "fed" by cells coming from several crypts surrounding it. One crypt usually "feeds" two villi to which it is attached on two sides. The shape of the crypt approximates to a cylinder closed at the bottom. Photo 4. Two villi with some crypts Photos 5, 6. Left - a crypt with its nuclei stained. Right - the same crypt, focus on the dividing nuclei (darker bodies) near the crypt axis. Photo 7. Surface of the epithelium of the villis. 1) The size of the crypts and villi is different in various parts of the intestine. In the small intestine of a rat, the crypt length is about 30 cells and its circumference is about 22 cells. 2) The period between successive cell generations is about 11 hours, although it is so only for the cells situated above the bottom. 3) In the bottom region, there are long-living, rarely dividing cells, some of which are considered to be the predecessors (stem cells) of the cells in the crypt cylinder. It is believed that around the crypt circumference, near the bottom, there are 4 to 8 of these stem cells present at a given moment. 4) In the upper part of the cylinder and on the villus the cells do not divide. It is believed that their division capability is exhausted because they have achieved the terminal stage as a specialized cell line. 5) Another phenomenon, relevant to our program, is the cell death observed in the region of the crypt bottom. Although the data here are not so definite, the death of these cells is believed to occur quite regularly and is even called a "programmed cell death". The above parameters remain essentially constant throughout the life of the crypt. A schematic view of the section made along the crypt axis. Continuous row of cells going to the villi is shown. Our program does not consider the cells on the villi. We also do not consider in this version the cessation of divisions in the upper part of the cylinder. Earlier, one mechanism that might account for the cessation of divisions was proposed (Ref. 1). The program does not take into consideration two other phenomena: 1) In addition to the main cell type, crypts contain other cell types differing biologically and having different behavior with respect to cell division. 2) Before a crypt cell divides into two, it changes its shape: its surface on the outside of the cylinder becomes quite small and the cell mass concentrates nearer to the cylinder axis. 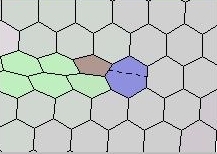 After the division, the shape is restored. We would like to note here that a comparison can be made between the structure of the crypt and the structure of other proliferating animal and even plant tissues. The proliferating cells seem to originate near the bottom of a cylinder or a cup, or near the center of a whorl; they subsequently move away from the center. This program considers topological events on the two-dimensional (although, curved) surface of the cell layer forming a cylinder closed at the bottom. 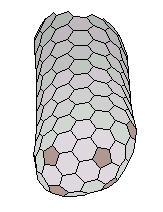 This is an idealized model: it is presumed that the cells are packed in a hexagonal lattice with all vertices being 3-rayed. However, to form the hemisphere of the bottom, we need to introduce six pentagons ("structural" pentagons) into the lattice. Crypts of any chosen size and shape are built in the part of the program called Crypt Builder. The division wave. Cell divisions are performed in the main program. The cells divide in a wave. On the shown here screenshot from the program, the wave proceeds from left to right. The front of the wave is formed by two cells, a heptagon (blue) and a pentagon (red). The dividing cell is always a heptagon (its expected division plane is indicated by the manually drawn dotted line). The wave proceeds along the row of hexagons in such way that the division plane of the heptagon is directed, on one end, to the hexagon in front of it (making it a heptagon) and, on the other end - to the pentagon (making it a hexagon). The wave leaves behind it two rows of hexagonal sister cells (light green) that gradually grow into regular hexagons. Initiation of the division wave. This program differs from the previously published model (Ref. 1) in the mode of initiation of the division waves. In the old model, the initiation was accomplished by cell division between "structural" pentagons in the bottom. It resulted in the formation of two heptagon/pentagon pairs initiating two waves. In this program, we used a different mechanism - the death (removal) of the "structural" pentagon, which results in the formation of a new "structural" pentagon from a neighboring hexagon and the formation of one heptagon/pentagon pair. The first figure (above, on the left) shows how, upon removal of the pentagon, its borders collapse forming 3-rayed vertices and its space is taken by the neighboring cells. The number of sides in the neighboring cells changes: two pentagons and one heptagon are formed. The second figure shows that when the heptagon starts dividing, it directs the plane of division to one pentagon, leaving the other pentagon as a "structural" pentagon replacing the one that was removed. The fates of these pentagons, of course, could have been reversed, had the heptagon directed the division plane toward the lower pentagon, and the resulted division wave would have taken a different direction. Moreover, when the pentagon was removed, the 3-rayed vertices could have been formed in five different configurations, resulting in the appearance of the heptagon in five different places. With these choices combined, ten different division waves are possible. Other situations where a pair heptagon/pentagon appears as a point of initiation are conceivable, although, in the present version of the program the initiation is restricted to the removal of a pentagon. Therefore, the program operates with six potential "dying" cells ("structural" pentagons) and six "stem" cells (the appearing heptagons), all situated near the crypt bottom. The program allows maintaining the crypt diameter and its structure in the steady state indefinitely. It shows which division waves are needed for the steady state proliferation and which waves will lead to the growth of the crypt diameter or to various crypt distortions. 1. Pyshnov, M. B., J. theor. Biol. (1980), v. 87, 189-200.